During the period between 1717 and 1723, J. S. Bach was in the service of Prince Leopold of Anhalt-Cöthen in Brandenburg. Prince Leopold was a great lover of music, but the Calvinist Religious services at Cöthen did not permit any religious music outside of the simple psalm settings of the Calvinist service . During this period, which Bach considered to be the happiest of his life despite the sudden death of his first wife Maria-Barbara, Bach devoted himself to writing instrumental works for both the Collegium Musicum, the municipal orchestra that was under Bach’s direction and for whom he wrote his famous Brandenbutg Concerti and for the musicians of the Court. Apart from the Brandenburg Concerti, other works which date from this period include several of the orchestral suites, the first book of the Well-tempered Clavier, the Chromatic Fantasy and Fugue, the Solo Sontates and Partitas for Violin and the Six Suites for Cello. The Six Cello Suites were written after the series of Solo Sonatas and Partitas for Violin and what is especially striking is the relative simplisticity of texture in comparison to the Violin works. The Dutch Cellist Anner Byslma has suggested that Bach had to simply the fugue movements of the Violin works to make them playable and found that the simplified textures implied the harmonic structure just as well. The Cello Suites would be, according to Bylsma, a further exploration of a more minimalist texture, which would account for the relative lack of ornamentation. The opening preludes are composed in the typical « Durchfuhrung » or « spun out » style typical of these works of Bach and use various arpeggios and scalar figures to set both the tonality and the general mood of the suite to follow. Of special interest is the Prelude of the 5th suite, which is in the form of a Ouverture à la Française much like the Overtures of Baroque Operas. In the second « fugato » section of this movement, Bach implies the entrance of the various voices rather than actually writing out all of the lines as he does with his Violin Fugues in the Sonatas. While the particular movements which follow carry the titles of Baroque Dances, it is doubtful whether they were actually intended to be music for Dance. Indeed, one might be tempted to wonder just how much dancing was done at the court of a Calvinist Prince. However, Bach does follow the general forms of the dance works, although they do not seem to be ideally suited for Baroque Dance. The Allemande during the time of these compositions was a slow, stately dance in duple time. Quantz, in his book of Flute performance practice, says that the Allemande should always be played with the beat on the half note. These movements also tend to exploit the « Durchfuhrung » style with a clearer phrase structure than the Preludes. The Courante movements were refered to as « Corrente » in the first published edition of 1825 by Norblin. The « Corrente » is a rapid virtuoso instrumental work in 3/4 influenced by the Italian school, as opposed to the slower Courante which was a French Court Dance which was danced in Six beats to the measure. The Courante of the 5th Suite would seem to be more of a true Courante. It would seem that the others were more influenced by the « Corrente » style, although they are clearly marked as « Courante » in the manuscript sources. The Sarabande is a slow dance in ¾ with the usual accents falling on the second beat. The study of Baroque Dance would indicate that the Sarabande is a bit more rapid than has generally been thought and that the accents do not always fall on the second beat, but may fall on the first beat for melodic interest. 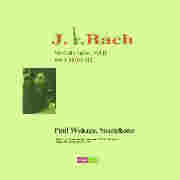 Bach frequently changes accent patterns throughout these Suites, so one must follow one’s instincts in this matter. The « Galanterie » or optional dances follow more closely the forms which are indicated by the dance forms themselves. Most of these movements would indicate a steady tempo, but contrasting tempi and dynamics should be explored in the second dance of each pair. It should be noted that it was common practice to omit the repeats during the da capo of each first dance. The Gigue movements may be divided into three seperate groups ; The French Gigue, was is a more simplified version of a standard dance movement, (the Gigue of the 5th Suite), A more virtuoso treatment of a Gigue Rythmn (the Gigue of the 4th Suite) and Gigues which explore a more complex rythmic structure which underlies the basic triple structure (the Gigues of the 1st, 2nd, 3rd and 6th Suites). Of Special note are the Gigues in the Second and Third Suites which use « ground » bass notes in much the same was a hurdy-gurdy to create more rustic sound. While the passages are usually simplified in arrangements for winds, the editor has chosen to retain these passages in this form, for although they add a bit of difficulty to the work, their omission generally makes the movements much less interesting. There is a great deal of discussion as to whether it is more appropriate to adopt a more « period instrument » approach to the performance of these works by playing them more objectively or whether one should follow the example of Pablo Casals and « interprete » them in the 19th century tradition. Personally, the editor feels that the solution lies somewhat closer to the historical, objective approach, especially in the context of performing these works on the Saxophone, as the expressive qualities of the sound itself will already add another element to the musical content. These issues , as well as the question of which repeats should be taken, where there should be additional ornamentation or which tempi work, are all questions of personal taste. There is no single right way to play these works, which is why they have fascinated musicians for so many years. In terms of the transcription of these works for the Saxophone, the editor can point to the works of Bach himself, which were frequently transcribed by the composer himself for difference mediums. Indeed, if one follows the Bass line of the Prelude of the Fourth Suite, it is apparent that this particular movement was not originally conceived for the Cello but was arranged from another source. It is as appropriate to play these works on the Saxophone as it is to perform the Well Tempered Klavier on the modern concert Piano. The editor has maintained the original tonalities for the 1st, 2nd, 4th and 6th Suites. The 3rd and 5th Suites have been transposed up one step to make them playable on Saxophones without the Low A. The issue of transposition does have meaning within the scope of mean temperament, but in the « well-tempered » musical world of Bach, it loses a great deal of meaning. Indeed, the notes which Bach wrote were not at all the notes that are played today on Modern instruments, nor were the works written to be played in Churches the same notes as those written for chamber instruments. In addition, the tuning used in churches during this period varies by more than a second between various regions of Europe. When Saxophones are made to be played at 415 with mean temperament instead of at 442 with equal temperament, this discussion will become interesting. The editor hopes that this new version of the Six Suites will be useful in allowing Saxophonists everywhere to perform these great works. For many years, Paul Wehage has been exploring the unique sound world that is the Bach Cello Suites. After many years of reflection and study, he has recorded this version which reflects his personal and artistic involvement of the work. A work in the baroque tradition reseen through modern eyes. Fascinating. Downloadable for $10.99 or Retail CD from $10.99 and up from Musik Fabrik. You select the packaging you want when ordering. 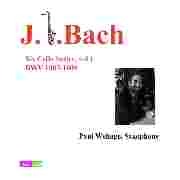 The second volume of Paul Wehage's complete Bach Suites. A tour de force performed by a master of the Saxophone.